* 1966 Beijing, China. Lives there. 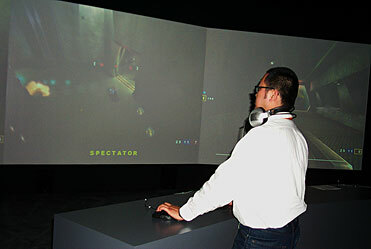 After months of playing the visceral action game Q3A (Quake III Arena) with others online, Feng Mengbo used its open source code to develop his own version for his performance piece (called Q4U). In it, he inserts his likeness into the matrix, equipped with a mini DV camcorder in one hand and a weapon in the other. Visitors both at the Documenta as well as at their computers at home are invited to play, though they are never clear as to if they're playing against the artist or other participants.